These days, most people are saving money any way they can. This can sometimes include forgoing car insurance in the hopes that no accidents occur. While not paying monthly insurance bills can save a bit of money in the short term, uninsured motorists have a lot to lose in the event of an accident. Accidents can happen to anyone at anytime. Event those drivers who take great pains to follow traffic laws may find themselves involved in an accident. If a driver is without insurance, costs can add up quickly, and often involve a number of different factors. Vehicle repair is just one of the many costs that can be present after an accident takes place. A single accident can cause unlimited damage to a vehicle, from dents and dings in the body to necessitating a full-scale engine overhaul. Depending on the vehicle in question, repair costs can easily escalate. Of course, this isn’t counting legal fees or medical bills, which can also be a factor when involved in an accident. The infographic below gives a detailed listing off all the possible fees that can occur after an accident. These fees can quickly become out of hand for the uninsured, who will then be responsible for all future payments. 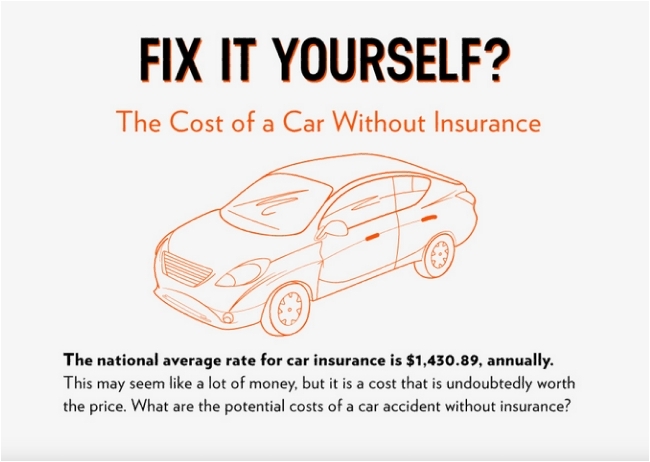 That’s why it’s integral that all motorists retain suitable insurance coverage for their needs. This coverage can offer protection in a number of circumstances, thereby sparing drivers from serious financial concerns.